Do you go crazy whenever you see food? A table full of food brings a smile on your face from ear to ear. Can’t decide on one thing when you see a food menu? Such situations may indulge you in overeating or binge eating, which is certainly not good for your health. Eating with friends – Hanging out with friends is the favorite pass time for most of us. As the good times roll, we might not take notice on the amount of food we eat. This could easily result in overeating. So the next time you’re with your friends, try to keep track of the amount of food you eat. Crockery – You would be surprised to know that the size of your crockery is a major contributor for your overeating. Big and fancy plates should be a total no-no for everyday meals since you can indulge in eating more than you are hungry for. Plates should ideally be medium or slightly smaller so that your food intake is less. Fatigue eating – Sometimes we end up mistaking the symptoms of tiredness for hunger, which is not always the case. Aim for at least 6 hours of sleep and if you still feel hungry, go for healthy snacks instead of junk foods. Speed eating – Speed eating may lead to overeating as it takes about 15-20 minutes for the brain to realize that your stomach has received enough food. Boredom – How many times have you walked into your kitchen in search of something to eat when you have nothing to do? It happens in the workplace too, when you are unhappy or not working, you end up munching on some snack. Experts say there are millions who over eat just because either they are bored or have nothing interesting to do. Keep yourself occupied and plan an eating schedule so that you don’t end up overeating. Dehydration – If your body lacks sufficient amount of water, you might overeat. Make sure you drink at least 8-10 glasses throughout the day. Monsoon is a beautiful season with a lot of greenery, great weather and fun. But, it is also the season of infectious diseases because the moisture is at its highest during this season. It brings a number of contagious diseases with it like common cold, cholera, diarrhoea, dengue, etc. As people spend quite a number of hours in their office, they are more exposure to viruses and bacteria at their workplace. Employees can catch the infection from various sources such as people they are working with, things they are using and the food they are eating. In fact, it is one of the major reason of absenteeism among employees during this season. It affects not only the efficiency of the employees but also the overall outcome of the company. However, there are some steps that one can take to prevent such infections and diseases. It starts with the assumption that everyone is potentially at risk of getting an infection. Once we assume that, we can take steps in advance that would help us prevent contagious diseases. At any workplace, an employer should ensure that a first aid kit is always available and a few staff members trained in first aid. Regularly wash hands: Most of the germs can be prevented from entering the body by just taking care of the cleanliness of your hands. Employees should be encouraged to adopt the habit of washing hands at regular intervals such as, before eating your food, after travelling by public transport, after visiting the toilet, using any equipment, etc. One can even keep a sanitizer at their desk to avoid infections. Take care of open wounds: An open wound or bruise may develop bacterial infection. Employees should pay attention to such wounds and should avoid working in such conditions. If they are still working like this, proper waterproof dressing should be given to such wounds. Not to share personal things: People should not share their personal things like handkerchiefs, tissues or hand towels to prevent germs from spreading. 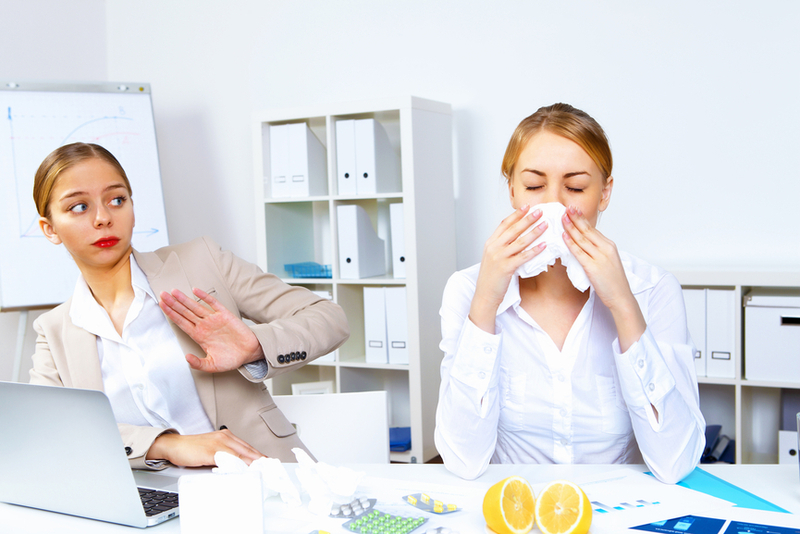 Stay at home while you are sick: If employees are seen coughing and sneezing at the workplace then they should be advised to stay at home. They might be suffering from a viral or bacterial illness which is contagious and can infect their co-workers also. There should be regular washing of floors. Employee’s workstation, floor, and bathroom must be properly cleaned every day. The office walls and ceiling should be washed at regular interval. Mops, brushes and dusters should be thoroughly washed and dried after every use. Drying mops & cloths is particularly important since many pathogens rely on moisture to thrive. There should be proper cleaning and care of equipment used at the workplace. Avoid getting wet in the rains, since it can harm your health and lower your productivity at work. Keep a spare set of clothes and shoes at work to change when you get drenched in rains. Try to stay warm and dry most of the time. Always dry your feet and hair after getting wet in the rains. Wash feet and hands with disinfectants a couple of times every day. If cold or fever persists for more than 2 days, see a doctor. Avoid eating fried or junk food. Include foods that boost your immunity, for example, more of green leafy vegetables in your diet. Since monsoon is such a lovely weather, no one can really avoid getting drenched in rains. A little prior preparation and preventive steps go a long way in keeping you healthy at your workplace during the monsoon. Don’t have enough time to work out? Or too tired to work out after work? Long working hours and unhealthy eating habits are causing adverse effects on everyone’s health. Lack of exercise in their daily life is making them unfit and vulnerable to many diseases. Efforts should be made so that their health, as well as their performance, is not compromised. Employers should motivate their employees to stay healthy by doing physical activities even at the workplace. In this article, we bring to you 5 exercises that you can do on your chair at the workplace. They won’t take much of your time and will keep you active whole day. Seated Toe Stretch – Sitting on a chair; start with the right leg by stretching it. Now lean forward and try to touch that extended leg. Keep the leg straight as much as you can. You don’t need to go all the way down to touch your foot, just try to stretch your legs and arms as far as you are comfortable. Switch to left leg after 30 seconds and do this 5 times with each leg. High knees and lateral raise – Take up one leg at a time as high as your knees can go above the ground. As you do so, raise your hands sideways at your shoulder’s height. You can even use dumbbells to make it more difficult. Remember to keep your back straight. Repeat this exercise 10 times with each leg alternatively. Seated leg extension and overhead presses – This one is little similar to the above exercise. Seating at the edge of a chair, press your hands in the upward direction and at the same time raise your leg straight at the level of your hips. Try to keep your legs parallel to the ground and straighten as much as you possibly can. Repeat this 10 times with each leg alternatively. Seated side bends – Bring your right hand behind your head and extend your left hand directly out in a straight line from your shoulders. Slowly crunch towards your right side, then get back to your sitting position and then crunch towards left. Do this side crunches 5 times on each side. And repeat the same by putting the left hand behind your head and straightening your right hand. Seated Russian twists – Firstly sit sideways on your chair to do this one. Now keep the back flat, lean just a little bit as far as you can control without letting the feet come above the ground. Now keep your hands in front of chest and rotate your shoulders from left to right and right to left. Try not to let any other body part move. Repeat this exercise 10 times on each side. Since employers have begun to realise that the employees are the most important assets to the company, they have started developing their workplace into a fitness-friendly place. This would help employees to stay fit and bring the best of them to their job every day.